Detailing the physical features, habits, territorial reach and other identifying qualities of the Zebra Swallowtail. Like the pawpaws it feeds on, the warm-weather loving Zebra Swallowtail is rarely seen outside of the American Southeast. 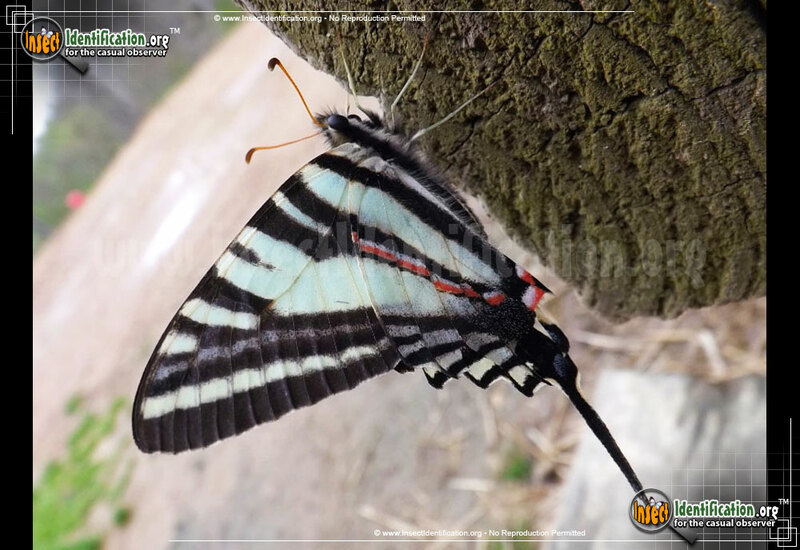 As part of its name suggests, the Zebra Swallowtail is white with black stripes. These stripes are thicker in individuals born in the heat of the summer. 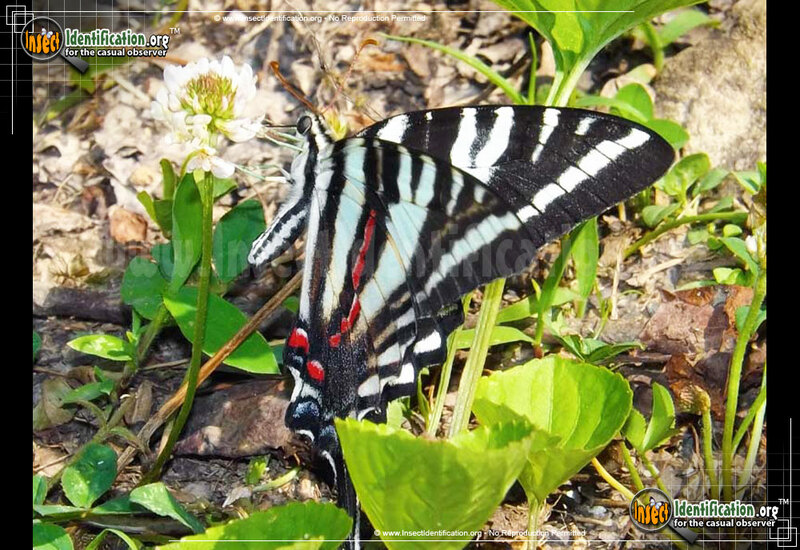 The overall wing shape resembles a kite, and this butterfly is sometimes called just that: a Kite Swallowtail. The long tail at the end of each hindwing is a common feature on most Swallowtails. They are narrow and white with black centers. A red spot at the inner edge of each hindwing lends a pop of color at the tip of the abdomen. On the underside of the forewings, the stripes are still present, but a vibrant red fills in the gap between two middle stripes. Iridescent blue sits at the bottom edge of the hindwings, just before the tail extension. 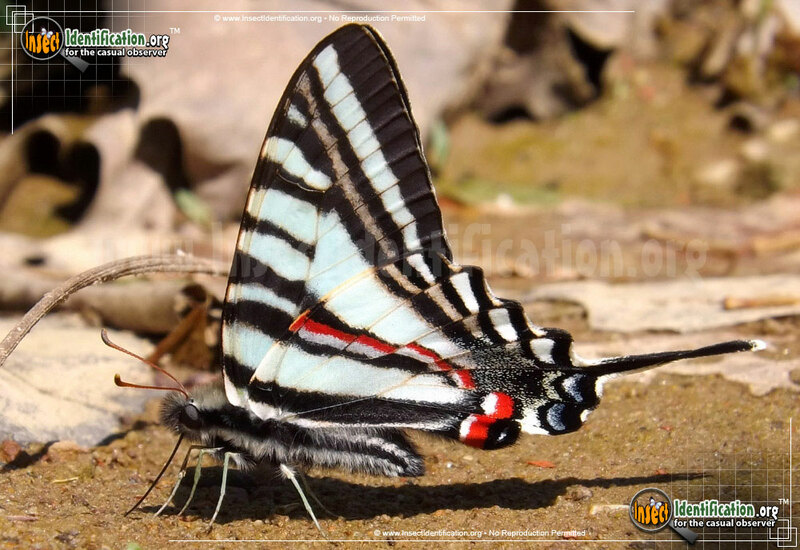 The Zebra Swallowtail is the only white Swallowtail in its range. It can produce 2-3 broods each year. They are mostly seen in the spring, but they fly all summer long. Caterpillars love to eat the leaves of the Pawpaw Tree, a native southern tree that produces large, impressive fruits that have a sweet, custard-like taste and texture. (Pawpaw fruit has rarely been seen outside of the South.) Larvae also eat from white squirrel banana trees, also called royal false pawpaws, that are native to Florida. Zebra Swallowtails can be found flying as late as December in the warmest parts of Florida. Caterpillars are fleshy and, depending on maturity, can be blue-gray, black, or green. A tri-colored band of blue-black-yellow forms a ring on a swollen area near the head. Look for adults drinking nectar from flowers in areas that are near woods and moisture. This species is a great example of an endemic insect benefiting from, as well as supporting, an endemic plant population.